The baseboards, that piece of wood designed to protect the wall from dings and knicks and even add aesthetic value, are the pieces of wood (or even composite) between the floor and the wall. Coming in a range of sizes, varying from one to more than six inches tall, these baseboards, just like your walls will need to be repainted over time, either due to time or simply the change of heart because you want a new color. As many people find painting baseboards to be quite the tedious task, many opt to hire a professional painter to complete the job for them. How much does it cost to paint baseboards? 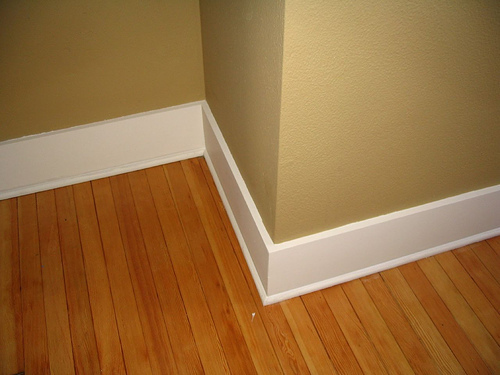 The costs to paint baseboards will depend on the contractor you hire, the type of paint used, the scope of the job and the geographical area you live in. Based on these factors, the average professional contractor will charge anywhere from as little as $1.75 per linear foot for a simple job to as much as $4 per linear foot for a job using a higher-grade paint. This is a quote for the baseboards only and would not include any other painting jobs such as painting door trim, window trim and/or the entire wall, for example. While most jobs are pretty straightforward, it doesn’t hurt to receive multiple quotes from screened and licensed contractors in your area. HomeAdvisor.com, for example, can connect you with multiple contractors in your area for free. All you need to do is explain your job, and from there, contractors will contact you with a free quote for your job. Porch.com, for example, noted the average project costs in the United States ranged anywhere from $165 to $409 per 100 linear foot. Dirty baseboards: For dirtier baseboards that require additional cleaning and prepping can often increase your labor costs by more than $100+. Lead paint? Any home built before 1978 may have lead paint on the trim. If this were the case, then the paint will need to be scraped and removed by the painter, leading to even more work. Depending on the job, this could increase the costs by hundreds of dollars. In the estimates mentioned above, this fee should include the materials, including both the primer, the latex-based paint and all of the necessary supplies, such as caulking, painter’s tape, paint brushes, and cleanup supplies, to complete the job. It will also include all of the labor, including prepping the surface before painting, such as sanding, patching, and caulking, as well as spot priming as needed. Two coats of paint, again, depending on the scope of the job and the contractor’s preferences should be included as well. A good painter will also include a limited warranty, protecting you in case of the paint fading or unsatisfactory results in the future. The first step often involves visually inspecting the existing trim to see if any areas need to be patched or caulked. Next, a good contractor will always caulk between the wall and trim, followed by taping off the trim from the wall area to make sure none of the paint gets onto the wall. Once taped, a good layer of primer paint is applied to ensure the wood grain doesn’t show through. This primer will also help prevent the paint from peeling in the future as well. Lastly, up to two coats of paint, depending on the condition of the wood, will be applied and will be allowed to dry, usually about 24 hours, before the tape is removed and the area is cleaned.